Starting at Thomas Jefferson's Monticello, the Thomas Jefferson Discussion Group of Orlando, Florida, began its sojurn to four founders' homes and other historic sites. We were treated like royalty (Mr. Jefferson will excuse the despotic reference) by our wonderful hosts at our third president's home in Charlottesville, VA. A special tour and reception that included the Thomas Jefferson Library was graciously provided. Then, the group proceeded to James Monroe's home, Ash Lawn-Highland. The following day the Jeffersonians toured The University of Virginia (designed and built by Mr. Jefferson) and Montpelier, Jame's Madison's home. The following day was spent at Mt. Vernon, George Washington's home. Some members also visited Thomas Jefferson's second home, Poplar Forest. The pilgrimage concluded at the Thomas Jefferson Memorial in Washington D.C.
To view photos taken by our group members, visit our gallery. Over 600 meals were provided to our community's poor and homeless neighbors by staff and volunteers. Inspirational music and speakers (not to mention a great meal) helped create an atmosphere full of hope and promise. Tom Borkes spoke at the weekly service of the University Unitarian Universalist Society. His talk was entitled: "Monticello and the Micro-circuit: Thomas Jefferson's Relevance in the 21st Century." The 40 minute presentation, which melded bits of history, economics, education and high-tech electronics, was followed by close to an hour and a half of questions and informal discussion! The response was a clear indication that Thomas Jefferson remains as relevant today as ever - always a lightning rod for political discourse. As Tom is fond of saying, "Regardless of world view, political persuasion or religious affiliation, everyone seems to want to claim Thomas Jefferson as their own." After an ambitious series of twelve monthly meetings in 2002, the Jefferson Discussion Group will explore the roots of the U.S. Constitution through a series of meetings in 2003. The meetings will consist of role-playing and discussion. Group members will take on the principal historical figures by reading from the Federalist, Anti-Federalist, and State ratification papers in an attempt to better understand the prevailing political atmosphere of 1787. In 2002, the group covered topics as diverse as The Government's Responsibility in a Free Market Economy and What Does it Take for a Good Revolution these Days?. A complete list of previous and upcoming discussion topics can be found here. Everyone is invited to either participate or simply listen in. Meetings are normally held on the third Tuesday of each month at Chapters Bread &amp; Books Cafe. Please refer to the group's website for more details. On April 13th, The Jefferson Project was privileged to co-sponsor, with the Florida Humanities Council, An Encounter with Thomas Jefferson. This one-man play, written by J.D. 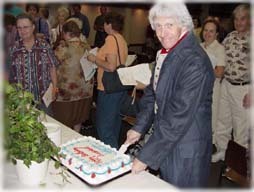 Sutton, was performed in commemoration of what would have been Thomas Jefferson's 259th birthday. The action of the play takes place at Mr. Jefferson's home, Monticello, on the morning of his 78th birthday, April 13, 1821. Mr. Sutton's costume and the set were created by his wife, Amy Hungerford-Sutton. Nearly 200 people, a record turnout, were treated to this authentic portrayal of our third president at the Orange County Public Library in downtown Orlando. Mr. Jefferson spoke of what he considers to be his greatest achievements: the authorship of the Declaration of Independence, the Virginia Statute for Religious Freedom, and the founding of the University of Virginia. Another highlight of the performance was Mr. Jefferson's question and answer session with the audience. Following the performance, the president spoke with his guests and shared a special birthday cake made in his honor. ORLANDO: Is there a line that divides Civil Disobedience from Terrorism? Is terrorism the sole domain of underground groups, like Osama bin Laden's organization? Or can governments also commit terrorism? On Tuesday May 15th, the night before convicted killer Timothy McVeigh is to be executed for the worst act of domestic terrorism our country has ever seen, a public forum of these questions will take place over dinner at Chapters Bread &amp; Books Caf� in College Park. The Jefferson Project is a local organization founded with the long-term goal of furthering education in the electronics technology industry, but also committed to furthering the social and political beliefs of our nation's third president, Thomas Jefferson. "Jefferson was far ahead of his time in so many of his beliefs," says Jefferson Project founder Tom Borkes. "And he always believed that education - the free discussion of ideas - was the single best means for improving yourself, and for society to advance." Co-founder Mark Goldstein agrees. "Jefferson believed that the United States could be a beacon for the entire world of how a country should conduct itself and the freedoms every one of its citizens should enjoy. But unless we appreciate our freedoms, and discuss them, and work to keep them, we'll lose them." The group intends to hold occasional meetings to discuss Jefferson's principles and writings in terms of current events. "We've got Jefferson enshrined in Washington, and chiseled on Mt. Rushmore," notes Borkes, "and sometimes we forget that he was a revolutionary, somebody who supported the overthrow of the established government. And some of the things he wrote two hundred years ago are as current and controversial today as they were back then." "At the same time," adds Goldstein, "We don't have any particular axe to grind or a particular point of view we're seeking to promote. What we are seeking to promote is the free exchange of ideas." This first discussion takes its theme from letters Jefferson wrote at the time of Shay's Rebellion, a few years after the Revolution, when debtors in Massachusetts rose up in armed revolt demanding relief against foreclosure of their farms. "I have ever held it," wrote Jefferson, "that a little rebellion now and then is a good thing. For what country can preserve its liberties if its rulers are not warned from time to time that the people preserve the spirit of resistance? Let them take arms. What signify a few lives lost in a century or two? The tree of liberty must be refreshed from time to time with the blood of patriots and tyrants. It is its natural manure." Part of this quote was on McVeigh's T-shirt when he was arrested. 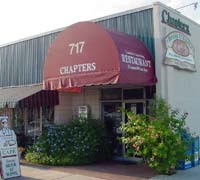 Chapters Bread &amp; Books Caf� is located at 717 West Smith Street, one block north of Princeton, just west of Edgewater Drive in College Park. The meeting itself will begin at 6:30 p.m. There is no charge for this event, but people are encouraged to patronize the restaurant for dinner. Reservations can be made by calling Chapters at (407) 246-1546. This first discussion will be moderated by J.D. 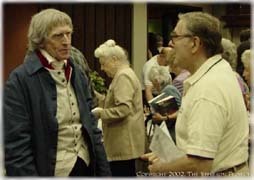 Sutton, whose one-man show An Evening with Thomas Jefferson has been performed at Chapters several times. "One thing I've found in doing my play is that people are drawn to Jefferson and what he has to say. And because what he says is so often so thought-provoking, I don't think we'll ever lack for good topics for discussion. This could be fun." For more information on The Jefferson Discussion Group of Orlando, please visit our website.